Its always special to hear about horses who have done well after rehab and even more special when there are photos! A short while back I heard from Elaine about Deutz, who came here last autumn and what a great picture she added to her email! Just thought I'd drop you a quick line to say Deutz won his section at Little Downham BE Novice on Monday. He finished on his Dressage score of 25.5. Next closest was Aussie Kevin McNab on 36.9! With Ros Canter and Kristina Cook also in the top ten it was a very competitive section and D showed them all how to do it. Comments on his Dressage Sheet prove barefoot and balance go hand in hand with an 8 for his paces! And time for a cup of tea whilst everyone else 'studs up'. He was one of only 2 horses across three Novice Sections to get round in the time. 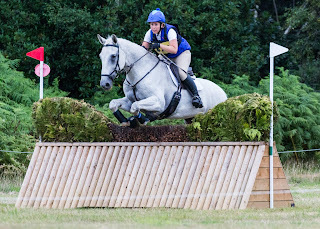 He wasn't even blowing by the time he got back to the lorry (lots of roadwork and hound exercise) and is now preparing for the Dressage Home International this weekend." "Deutz was 6th Individually at the Home International and team 4th. 34 teams competed and the standard as you would expect was very high. Deutz had lots of admirers who watched both his tests but his dislike of simple changes in the first test and Philip doing his give and re-take in the wrong part of the circle in the second test cost him dear! Lots of interest in his rock-hard feet and a couple of other unshod horses there, several more with just front shoes. Discussions too about his feeding regime; he looks great and is super fit. He's doing his favourite thing again on Sunday: off with the Kent and Surrey Bloodhounds." Freddie has been here for 8 weeks so its time for an update. The biggest changes visible from this angle are in the hairline, which is more balanced now (below) than it was when he arrived (above). His toe is also considerably shorter and his foot is therefore more supportive. If you compare the back of his frog and digital cushion its stronger now (below) although I must apologise for the lack of focus - Freddie can be a fidget. Its difficult to see from this angle but one of Freddie's issues is poor medio-lateral balance on both feet, but worse on this one, which leads him to land on the outside edge of the foot. It will take a while for this to improve but its likely that he will develop a medial deviation on this foot for support. Again, the main improvement is a hairline which is no longer nose-diving at the back and a more supportive palmar hoof. His frog is more robust now (below) and his foot is becoming more concave, though this will also take several more months to fully develop. Not the clearest of shots unfortunately but as with the right foot it is on the way to having improved media-lateral balance. Jet went home yesterday and so its time for an update on his feet. He arrived back in July (above) with a diagnosis of navicular bone damage on MRI and was landing flat on his left foot and fractionally heel first on his right. Twelve weeks on and in the most recent photo, above. his feet are much less under-run with a shorter toe and he has a correspondingly stronger palmar hoof, which has led to a better landing (footage is below). Comparing his frog and digital cushion between July (above) and October (below) its clear that there is still work to do but it is less contracted and he has the beginning of better concavity in his feet. Like many ex-racehorses Jet's palmar hoof has been compromised by early shoeing and may never be as robust as it would be if he had remained unshod but he has made progress and his feet should continue to grow stronger over the next few months. From this angle the new growth (below) is clearly visible about halfway down his foot. It will take at least another 3-4 months before he has grown in a full new hoof capsule. Jet has stronger heels and a better frog today (below) than he had when he arrived (above) but there is still lots of work to do. A stronger and more robust digital cushion is now visible (below) but again Jet needs to continue in regular work for a good while yet before his feet will be as good as they can be. Last week I re-posted an old blog article about flare and hoof wall deviations in response to a query from an owner as, although I originally wrote it in 2013, its a post I still stand by (the post is here for info). For regular blog readers its probably old news but of course every time a new owner starts to question whether they want to shoe their horse (or continue to shoe their horse) a new dialogue begins. Its true though that many of the discussions still sound the same as they did when I first heard them. When we are discussing flare on hooves there are still frequently comments that the flare is causing a problem - most commonly either distorting the hoof capsule or interfering with the movement of the horse. An owner who is interested in trying to go barefoot and who canvasses opinion online will (still!) 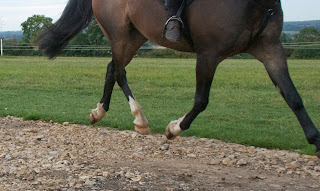 often be told that a barefoot horse cannot work extensively on the roads because roads wear the foot away or that a barefoot horse cannot jump on grass because studs provide essential grip. 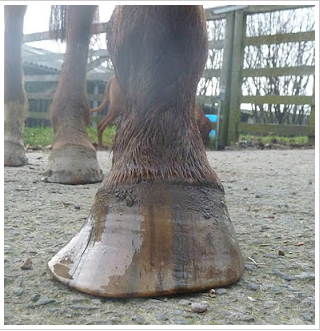 Similarly, several times a week I receive emails from owners whose horses have been diagnosed with palmar hoof problems - most frequently long term lameness which is cause by tendon, ligament or bone damage within the hoof. 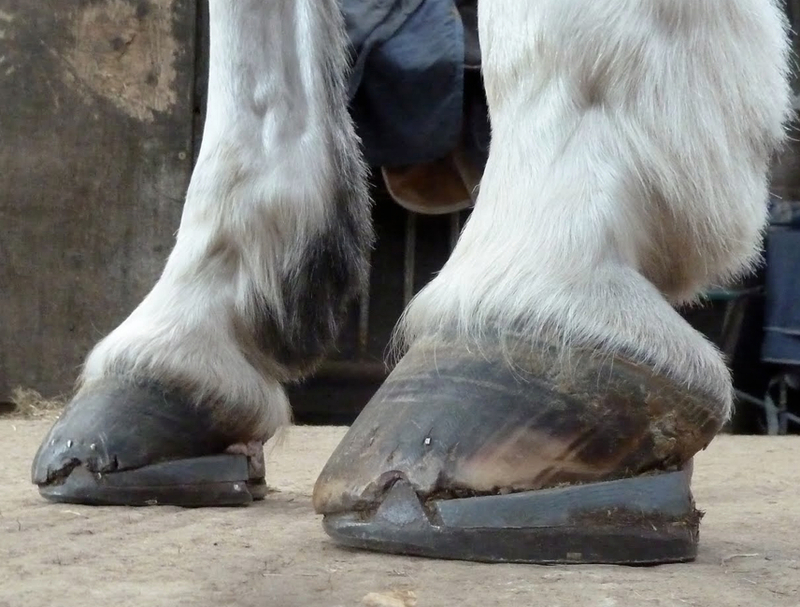 Very often the owners will have been advised to use remedial shoes to provide "support" for the palmar hoof. There is nothing wrong - in fact there is a lot right - with asking for advice both from professionals and from friends with experience. There is nothing wrong with getting advice online, for that matter. But in every case I would suggest it pays to test the quality of that advice before you act on it. For me its as simple as asking "How?" (or sometimes "Why?) and listening carefully to the answer. If it doesn't make sense I would not be afraid to ask again, and again, until the answer really stacks up. So if you ask someone HOW flare damages feet you will usually be told that the hoof wall will distort or that the foot will unbalance. I think people tend to talk like this because a foot with flare looks unattactive and is not symmetrical but in reality flared hoof wall is weak; its just not strong enough to compromise an otherwise healthy foot. If in doubt, leave it alone and you'll see it either break off or grow out (if it does neither its not really flare and is most likely there for support, for the reasons I have described in the article at the top). If you ask HOW roads wear hooves away then people generally look confused because they have never thought that far themselves (the answer is that they don't, handily contained in this post http://rockleyfarm.blogspot.co.uk/2013/05/what-happens-when-hoof-wall-wears-away.html). If you ask WHY studs are essential you will be told they enhance grip but very few people can explain exactly HOW. Yet if you talk to an engineer or many farriers they will tell you that studs cannot be big enough to affect the hoof, especially at speed, and that on soft ground they have even less effect. On very hard ground, when they can affect balance, most farriers agree they are damaging in any case. If you are feeling provocative you can ask HOW remedial shoes provide palmar support. However it may be safer just to quote Steve Leigh who pointed out some years ago that the horse, when barefoot, stands on this thing called "ground" which supports him all round, for miles, and that using a shoe actually reduces the ground-bearing surface of the hoof. I am sure there are many more interesting discussions to be had when we start to ask HOW and WHY a bit more frequently, particularly when we are asked to do something which makes no sense at all to our horses. Go on, channel your inner toddler - you know it makes sense!